Looking for some chew-friendly, soft blocks for baby? 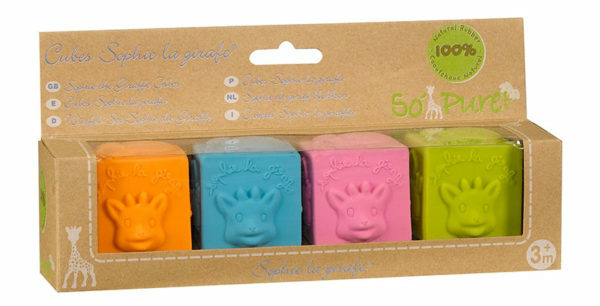 Sophie the Giraffe Cubes are as great to (safely) chew on as they are to play with! A set of four rubber blocks in glorious summer colours, their raised signature Sophie the Giraffe and garden motifs are sure to delight your young baby. Made from 100 per cent natural rubber, these blocks are perfectly safe for babies to explore with both hands and mouths. No matter your baby’s stage of play, stack them, roll them, toss them, your baby – and floors – will thank you. Sophie the Giraffe Cubes are available from Pottery Barn Kids, $29.